The fitness industry has experienced many ups and downs over the past three decades—and Shapes has operated in both a down and surging economy. The founder of Shapes, Vince Julien, has been in the fitness industry for most of his adult life and was the first to recognize that the women’s only fitness market was underserved. Opening his first location in1986, Shapes quickly became the go-to fitness center for women who wanted to exercise in a facility devoted to their unique needs. Shapes facilities have always been state-of-the-art, providing members the best in the industry in terms of equipment, personal training, group fitness classes and small group training. The original Shapes locations were much larger than today’s new look model. Our boutique style has allowed us to really focus on the member’s experience. Shapes have built a system that is laser-focused on the needs of women and provides a place where they can feel comfortable and safe. The goal of every fitness center is to help members get results—and we know very well that if they are not comfortable in the center, they will not come. If they don’t come, they lose interest and do not get the results that they had originally wanted. We are passionate about helping women. We hope you are too. Fitness is a $19 billion industry. Women account for 52 percent of club users, we can assure you that the women-only centers are very profitable. Shapes offers something that larger or multi-purpose facilities cannot. We can offer—a place for women to exercise in an environment that provides both privacy and comfort. Shapes is a place where they can develop friendships, bonds and relationships with other women who share the same goals. A large percentage of women prefer training in the safety and comfort of a women’s only environment. What makes Shapes unique is that our model has incorporated a center that provides a full line of equipment and programming into an environment that has a boutique feel. Boutique studios focus on group or specialize in one or two fitness areas. 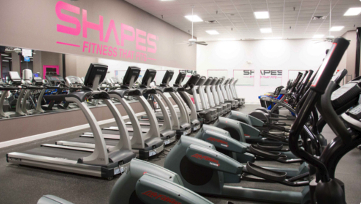 However, Shapes has a full line of selectorized equipment, 30-40 group training classes each week, small group training, personal training and free weight areas. One constant has remained through nearly 43 years—Americans typically exercise against their own will. Many women are just not comfortable working out with men. Therefore, this becomes the primary reason why women don’t join a health club/fitness center. Shapes has built a system that is laser focused on the needs of women. Shapes provides a place where they can feel comfortable and safe. The goal of every fitness center is to help members get results. We know very well that if they are not comfortable in the center, they will not come. If they don’t come, they lose interest and do not get the results that they had originally wanted. Our focus is our clients’ personal goals. Our mission is to provide our clients with both personalized and customized training programs that change their daily routines. Put simply, our staff helps them make improved lifestyle choices. The fitness industry in general relies on new members coming into the center. Natural attrition occurs in every center in America and we are no different. Providing members a clean, friendly and well programmed center helps to increase retention—but we still continually market our centers to attract new members who have just arrived into the community, as well as, women who have decided the time is right to improve their overall health and fitness levels. Our marketing team handles all of the branding, promotions and social media. In addition, we provide you direct wholesale pricing on pro shop items for resale, printing, promotional products and staff shirts. We don’t receive any form of rebate and want to ensure you always have the best products at the best prices to support your financial success. We are often asked if experience in the fitness industry is a pre-requisite to owning a Shapes® Fitness Center. It is not. However, having a passion for fitness, health and wellness is strongly recommended. Our training forms the foundation for you to prosper! We will ensure that you are prepared to be an owner and operator of a Shapes® franchise, regardless if you are running the operation on a day-to-day basis. And, we help you train your managers and staff so that the business runs smoothly even when you’re not there! Shapes® Fitness for Women is listed in the Franchise Directory under the Fitness category. It's also listed in the section for Franchises Under $250,000.